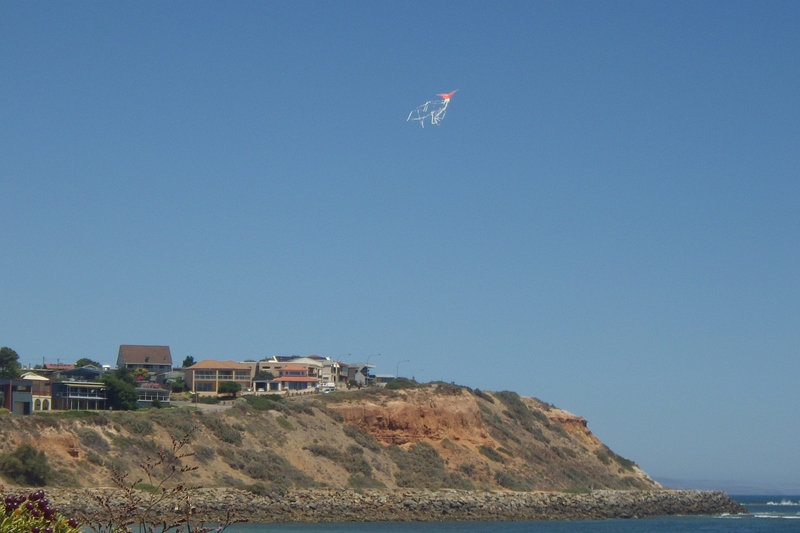 On arrival with the MBK Paper Diamond kite, all looked good for a photo-shoot at the beach. There were just 20 or 30 people about and a Gentle sea breeze gusting into the Moderate range. Brilliant sunshine poured down from an almost totally blue sky. 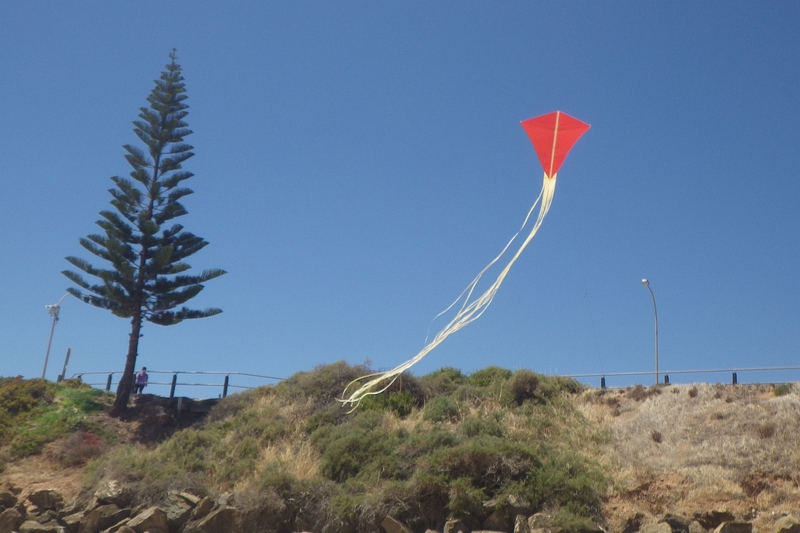 Being towards the shore, the breeze would pose no risk of losing the kite into water if the thread broke. On one other occasion down here, a dog broke the thread! 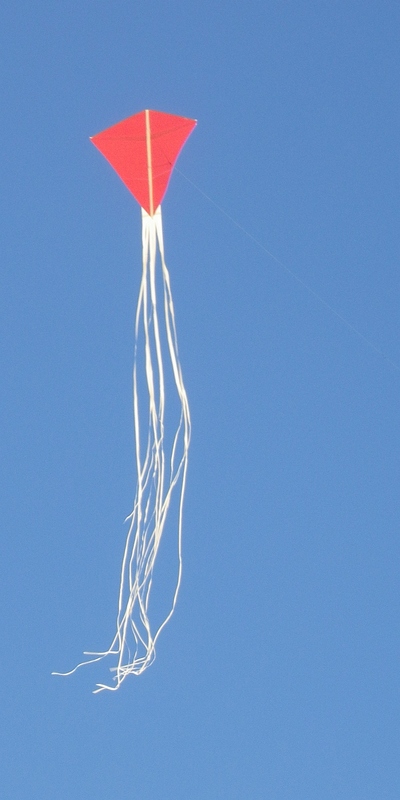 To start with, the kite was put up on a short line to get some close-up shots. The small red Diamond swirled from side to side in the Moderate strength gusts. Turbulence from my own body upwind probably wasn't helping at times. With photos done I picked up the winder in one hand, the bag in the other and walked further down the beach to a more spacious area. On a little more line length, a few more photos ensued. A tall tree and the rocky man-made slope behind helped make the pics a little less boring. One shot even happened to include a flying seagull not far from the Paper Diamond kite. A happy coincidence! It's the second photo in the Gallery near the bottom of this page. I noticed a couple of small tangles in the thread as it was being let out, but decided to just leave them. The Paper Sled, with it's increased pull force would have come close to snapping the line. Thankfully, the Diamond remained attached. In any case, it would descend very quickly to the sand if the thread did snap. Holding up the wind meter it registered 18kph gusting to 21 kph. Ideal wind speeds for the little Paper Diamond kite which was flying quite steady with it's long multi-streamer tail stretched out behind. 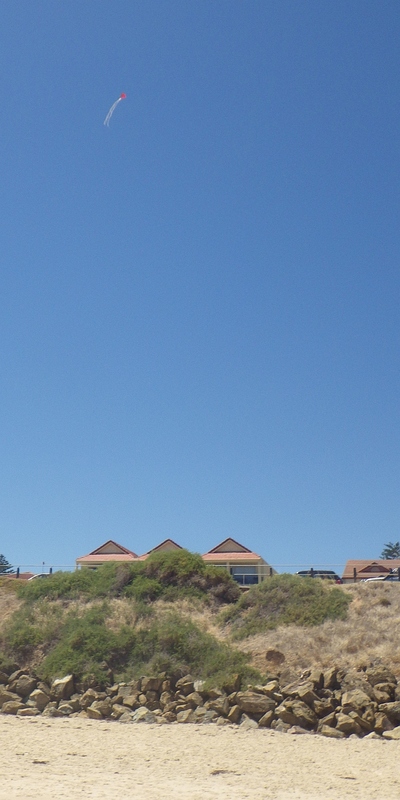 You can always add a few kph of wind speed when the kite is over 100 feet up. Now it was time to let out quite a lot of thread to get the shot which shows the kite as just a dot :-) It makes an impression, illustrating how a tiny kite can fly really high if the flying line is light enough! Polyester sewing thread in this case. The lightest stuff, for general sewing applications. Never-the-less, the thread can resist well over a kilo (2 pounds) of tension since it is polyester. Essentially the same stuff as Dacron! As sometimes happens, 2 people approached and didn't realize they were walking under the thread until the last second, prompting a surprised comment! 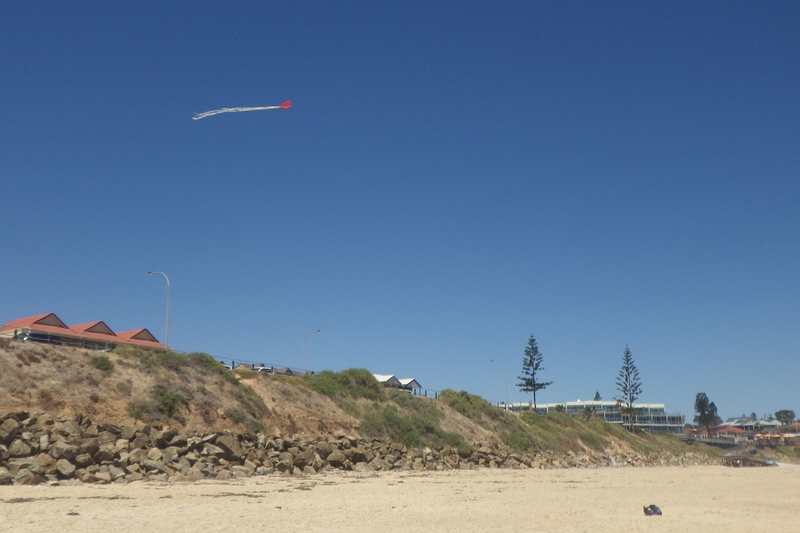 At the time the kite was holding a good 50 to 55 degrees of line angle. Only people walking within a few meters would even see the thread, let alone get close to it. Some video footage was taken, panning around the beach to catch the crashing waves, a distant rocky outcrop and some of the local buildings. It was a pity that almost no cloud was present, since nothing much appears to happen while panning up and up to find the flying kite! By this time the sea breeze had moderated somewhat to 15kph gusting to 17kph. That's smooth! 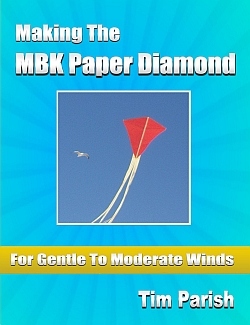 Finally I returned to near the concrete steps to get more closeups of the MBK Paper Diamond kite. Also, some scenic shots were taken from behind the kite and up the steps. I got one surprised look from down on the sand. 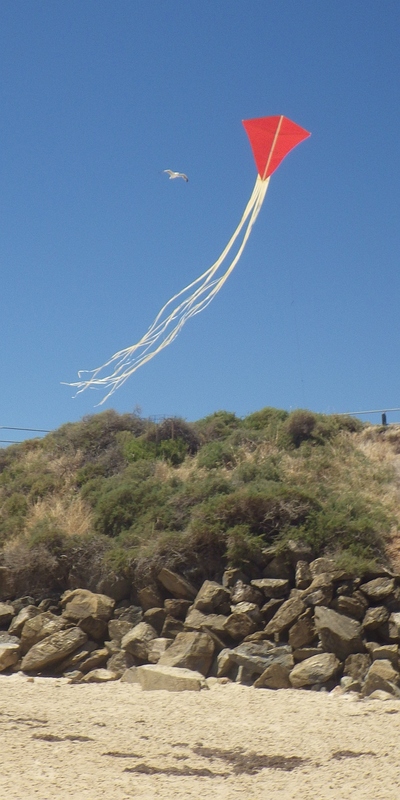 It must have appeared that I was just walking off and leaving the bag and flying kite behind! This day had been a while coming. That sea breeze was important! It turned out to be perfect conditions for a photo shoot.